It is with great sadness that I report that Watts Humphrey has passed away. Botnets control more than 2 million PCs in the U.S. This seemed a little low to me until I saw the specifics: 2.15 million bot infections were detected and removed the 2nd quarter of 2010. AND 2.16 million bot infections were detected and removed the 1st quarter or 2010. These are just the ones found by Microsoft, and only the ones they removed. Again, this doesn't include ones they didn't remove (or didn't detect). Also it doesn't include any other vendors. Federal law enforcement and national security officials are preparing to ask Congress to require all services that enable communications — including encrypted message transmitters like BlackBerry, sites like Facebook and messaging software like Skype — to be technically capable of complying with a wiretap order. The mandate would include being able to intercept and unscramble encrypted messages. 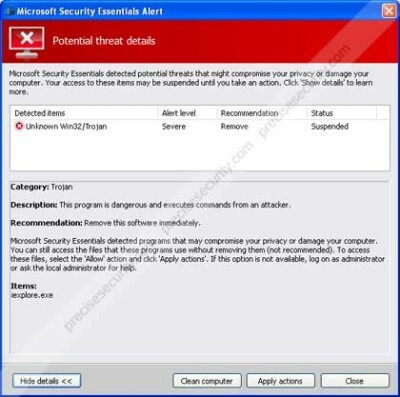 During this fake online scan only the 5 fake anti-virus programs listed above will state that this supposed Trojan is an infection. It does this to scare you into clicking the "Free Install" button next to them that will install the rogue program onto your computer and then reboot your computer. Finally the companies that produce the most commonly exploited software apps are doing something that may actually help. Microsoft & Adobe are working on having Adobe Reader run in a protected mode.For more details read the full article. This is the latest email threat. If you get an invoice email from Buy.com delete it! Windows users should go get the update now, read the Full Story for the details. The Washington Post reports that the Pentagon's newly formed cyber command will, if faced with a cyber attack, be able to respond in kind. Lt. Gen. Keith Alexander's exact words were It is "reasonable to assume that returning fire in cyberspace" is lawful, as long as any actions comply with the laws of war. What do you think? Djibouti was an experience worthy of writing about. It's too bad I'm not a writer. The flight to & from alone are worth thousands of words. I was at Camp Lemonnier in Djibouti, Djibouti. Yes I meant to type that twice. The US Navy Base is the headquarters for the Combined Joint Task Force - Horn of Africa (CJTF-HOA). I worked for the DoD in a Navy office with an ID card that said US Army. Go figure. Long days, hard work, but I learned a lot and meet some great people.